This time last year, I was huddled around my computer for a better part of the long weekend, choosing fonts, colours and layouts. Slowly but surely, and only taking minimal breaks for cider and cycling, I was able to breathe life into this site. I can't believe its been a whole year since then, and to celebrate, waffles seemed appropriate. We had a simpler iteration of this breakfast last weekend for N's birthday -- apparently waffles have become the go-to way to kick off celebratory mornings. 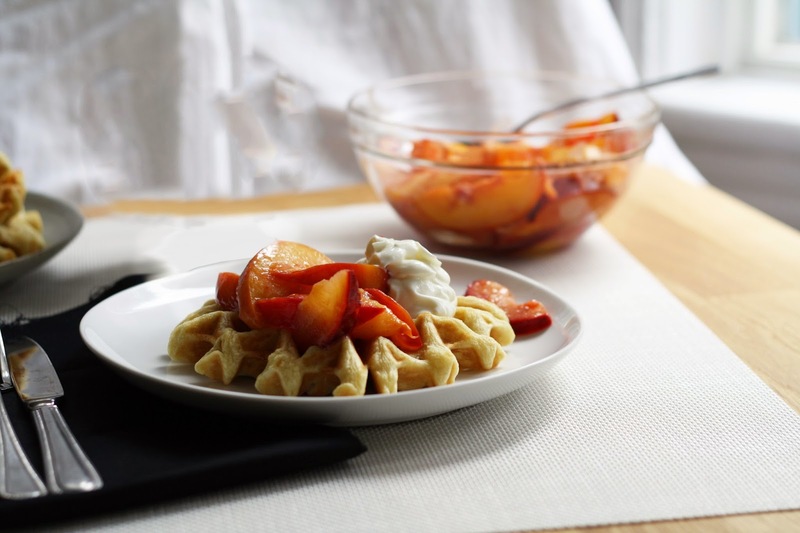 To take advantage of lazy long weekend mornings and the abundance of stone fruit while it lasts, whip up a batch of these waffles this weekend (if you can). Happy Labor Day folks! Whisk together the flour, sugar, baking powder and baking soda. Set aside. Place 1 T of white vinegar in a 1 cup measuring cup. Fill the reminder of the cup with milk, and let sit. (This is a foolproof way of making non-dairy buttermilk, as the vinegar will cause the milk to curdle). In a microwave safe bowl, melt the butter. Add the egg and curdled milk to the bowl and whisk gently to combine. Pour the wet mixture over the dry and mix just until incorporated and lump free. 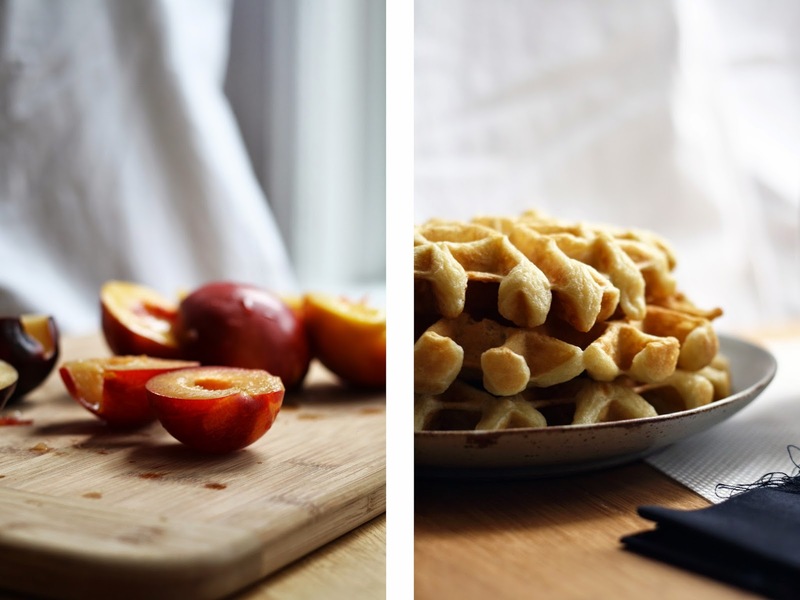 Allow the mixture to rest while you heat up the waffle iron and prepare your fruit. Slice all the fruit into thin segments, about 8 slices per fruit. Set aside. In 1/2 cup intervals, scoop the batter onto the waffle iron, and allow to cook as per waffle iron instructions. Allow the cooked waffles to rest on a wire rack, to avoid getting soggy. While you're making the waffles, warm the butter in a skillet over medium heat. Add the fruit, juice and vanilla, stir gently, and allow to cook for 5-7 minutes. Stir only minimally to avoid breaking up the fruit. Serve a warm waffle with a heaping mound of fruit and a scoop of vanilla ice cream or plain green yogurt.